The Staples Pocket Ortho Mattress is a comfortable mattress to give you perfect night of sleep. This mattress is a pocket springs mattress, which means that the springs are all covered in a separate fabric pocket. The advantage of these 800 pocket springs is that every part of your body is supported individually to align your body in the right manner. No longer you will weak up with pains in your body. This mattress is orthopaedic and therefor perfect for people with back problems. The Staples Pocket Ortho Mattress has a double density filling to give a more firm support. This mattress is suitable for divan beds and slatted bedstead since it is strong enough to stay straight over the gaps. This mattress can be used for a long time because of the durable damask fabric that is used to cover this mattress. The Staples Pocket Ortho Mattress gives a maximum pressure relief by spreading the weight of the body out over the whole mattress, making you turn and move less. The Staples Pocket Ortho Mattress is available in all sizes: a single of 90cm by 190cm, a small double of 120cm by 190cm, a double of 135cm by 190cm, a king size of 150cm by 200cm and a superking of 180cm by 200cm. 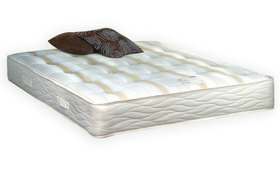 This mattress is easy to handle since it does not require to be turned around, yet it is recommended to simply rotate using the handles provided.Where certain mattresses are very comfortable but to soft and causing you back problems, this mattress will feel firm and give you a perfect night of sleep without to much turning during the night or back problems in the morning.